Thank you for your time, work and ministry on behalf of homeschooling families. Thank you also for your interest in participating in the NCHE Thrive! Conference vendor hall. First, allow us the opportunity to introduce ourselves to you as you will be working with both of us in this process. Debbie Mason is the events director and chair of the conference committee. She started homeschooling in 1981 and has now graduated all 4 of her children. She has been on the conference committee since the late 80s, but has been the chair the committee for the last couple of years. 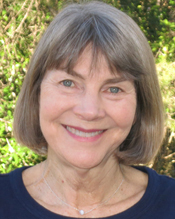 Debbie and her husband, Spencer, have been on the NCHE board since 1988. Debbie’s email address is debbie.mason@nche.com; cell phone 704-607-0618. Spencer Mason assists the conference committee. He is also the law and policy director on the NCHE board. 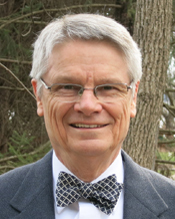 He has been on the NCHE board since 1988 and has held many positions including president. Spencer’s email address is spencer.mason@nche.com; Cell phone 704-661-6299. We are expecting around 7,000 attendees this year—homeschool parents, teens and children. These families will come from across the state of North Carolina as well as neighboring states. The conference always generates a high level of energy and enthusiasm among conference attendees. The NCHE conference is a highlight of NC homeschoolers’ year. We look forward to working with you at this year’s conference. What you do is truly a ministry, and we appreciate you so very much. If you have any questions, please don’t hesitate to contact us. We will have a page on the conference website just for you (this page will be updated for the 2019 conference in mid to late September): http://www.nche.com/conference/vendors. If you are applying for the first round of selections, complete this application and submit along with payment by October 20, 2018. In order to be considered, you must include payment with your application. If you prefer to pay by check, mail a check made out to NCHE to the address below. Your payment will be mailed back to you or reimbursed if you are not selected for the 2019 vendor hall. After October 20, applying vendors will be accepted as space allows. Selection will be made based on the benefit of the product or service to homeschoolers as determined by the conference committee. Booth space is given on a “first come, first served” basis. Select vendors, called exempt vendors, have first choice before vendors submitting applications. Available booths are shown on the map and under “Booth: First Choice.” Vendors will be considered for selection after the completed application is submitted and payment is received. We will do everything possible to address the needs of each vendor, but we cannot guarantee a location or dimension of your requested space. NCHE will notify vendors as soon as we can if selected. The first round of selections will be made in early November. Vendors may be chosen by the conference committee for exempt status. Exempt vendors do not need to go through the application process and have first choice of booth locations. Colleges are given the opportunity to have a booth in the vendor hall. If they are selected for the vendor hall, they will also need to man a free booth in the College Fair on Friday from 10:00 am to 3:00 pm. For this purpose, they have permission to leave the booth in the vendor hall in order to cover the table in the College Fair. Colleges also have the option of just doing the College Fair, and the cost is $85 (includes a sandwich). Here is the application to be in the college fair only. Vendors may conduct vendor workshops to explain the benefits of their product. Doing a vendor workshop gives you an opportunity to explain your product or service in a more detailed way to a group of interested people. The cost of each workshop is $75. The content must relate to home education and not exceed 60 minutes. Early application will improve the likelihood of getting the workshops desired. Apply for Vendor Workshops using this form. You will also have the opportunity to order AV for your workshop. Vendors have the opportunity to purchase a contact list for attendees who agree to allow their contact information to be given. Vendors must agree to use these contacts only for their own business and not to loan, rent or sell these contacts. In 2018, there were 725 families who gave permission. Request this on the payment form. NCHE will offer a signature card, one per family, to help to draw attendees to your booth. Adult attendees who complete the card by having someone at the booth sign the card, will be entered into a drawing for a $250 cash prize. The signature card will have a minimum of 5 vendor names and a maximum of 30 vendor names, on a first come first served basis. We are offering the option of ordering a sandwich for lunch that will be delivered to your booth: turkey with American cheese and lettuce and tomato on white bread for Friday lunch and ham with Swiss cheese, lettuce and tomato on wheat bread for Saturday lunch. We realize that these are expensive for just a sandwich, but we are making them available for your convenience; there is no profit in it for NCHE. There will also be a concession stand available. You may order electricity, laptop and LED monitors to use at our booth. A conference workshop is a non-vendor, non-commercial workshop. It must relate to home education. There is a selection process. If your conference workshop is selected, you will be informed by late January. Fill out the online speaker application NCHE Thrive! Conference Speaker Application. It is due by November 30. The printed conference program is a quality publication. Our program is distributed to all of our adult attendees for free and is a vital tool to them while they are at the conference. You do not have to be a conference vendor in order to advertise in the conference program. Please indicate your interest in learning more about Conference Program Advertising in the application. Here is the link for the conference program advertising information. For over thirty years, our flagship magazine has been bringing words of encouragement, methods of homeschooling, stories of student success and news to keep homeschoolers informed. GREENHOUSE is available in print and digital formats. You can learn more about GREENHOUSE advertising rates on the website. All vendors are welcome to begin setting up Wednesday, May 29, between 3:00 and 8:00 p.m. Additional set-up time will be offered after 7:00 a.m. on Thursday, May 30. Due to facility climate control, loading dock doors will close at 11:30 a.m. All vendors must be set up and ready for business by 1:30 pm on Thursday May 30. Please note that there are no dollies provided by the convention center. Vendor Hall operating hours for 2018 will be as follows: Thursday 1:30 pm to 7:30 pm; Friday 9:30 am to 7:30 pm; and Saturday 9:30 a.m. to 4:00 p.m.
No shipments will be received at the Benton Convention Center, the Marriott or the Embassy Suites Hotel. Shipment of all materials must go through Hollins Exposition Services. They will be contacting you with drop shipping information closer to the conference. For information on NC sales tax, contact the Revenue Department, Sales & Use Tax Division at 877-252-3052. No vendor is allowed to sublet space to another vendor unless permission is obtained by conference committee. All vendors must be invited by the NCHE conference committee. Vendors must be considerate of other vendors. If your demonstration causes noise that becomes a nuisance to vendors around you, you will be asked to stop or lower the sound level to an acceptable level. Vendors may sell only during vendor hours. Booths must be manned the entire time of the conference (allowing for short absenses) unless special permission is granted. We will allow 4 free vendor nametags per first booth, Two additional free nametags will be allowed for each booth after that with a cap of 10 free nametags per vendor. We will charge $10 per nametag beyond those allowed for free and for those purchased onsite. Embassy Suites 800-696-6107 and Marriott (800) 320-0934 are part of the convention area. The rooms in the Embassy usually fill up quickly. October 1 (at 9 a.m.) is the first day reservations are open. The name for our block is “Thrive-Home Educator,” and you must call to get the block rate. There are several other hotels not too far away. To find the current list of lodging, go to https://www.nche.com/thrive/lodging (when the website is updated for 2019 in late September). Received by November 30 will receive an 70% refund. Received by December 31 will receive an 60% refund. Received by January 31 will receive a 40% refund. Received by February 28 will receive a 30% refund. No refunds will be given after March 31. In this section please tell NCHE about your organization. This is the contact information for the organizational representative who will be at the conference. If this is not known yet, leave the fields below blank. Vendors attending the conference will have organization and product/services information printed in the conference program. If this section is left blank, your organization name, booth number/s and website will be the only things listed. How you want to be described in the program. In 480 characters or less, describe your company, booth or product in the way that you want it described in the program. Please use paragraph format and complete sentences. New vendor applicants are required to complete this section. Vendors who have participated in the conference within the last three years and who have not undergone any significant organizational change may skip this section. List and describe your product(s) and/ or service as well as any unique qualities. List any product or company endorsements you have received as well as any major events you have attended. Tell us about your organization's mission and history. When was your organization established and what are you trying to acheive? Please describe your homeschool experience, or if you are not a homeschooler, describe why you support homeschooling. In this section, provide information about your booth selections. Most booth spaces are 10 feet wide by 8 feet deep and include an 8 foot table, two chairs and drapes. There are a few unique booths available with each space being priced according to its size and location. There may also be variations in booth layouts because of structural restrictions, etc. 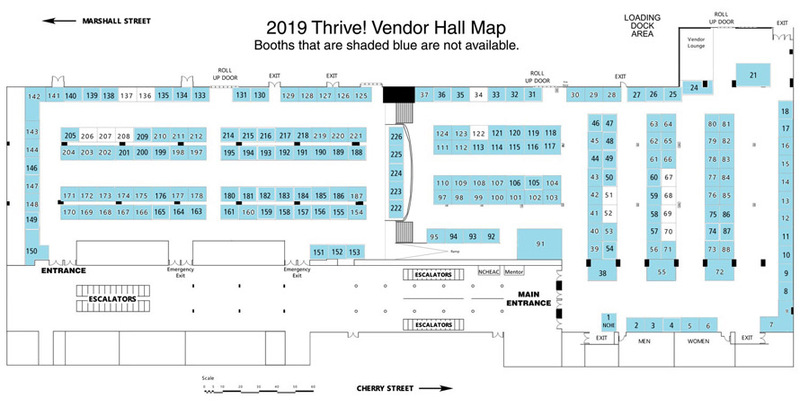 The following table groups booth by prices, and the map shows booth location in the Thive! vendor hall. Booths that are available will show up in "Booth: First Choice." Identity the booth/s you would like to rent during the conference. NCHE does everything we can to give vendors their first choice booth(s). However, sometimes we cannot accommodate everyone's requests. In order to help understand where there is flexibility, we ask that you tell us about your second and third choices. Tell us about any requirements about your booth shape and size. If your first choice booth(s) are not available, what would be your second choice? Provide any additional information about your second choice(s). If your first and second choice booth(s) are not available, what would be your third choice? Provide any additional information about your third choice. In this section, tell us about each vendor workshop you would like to offer attendees. You can submit up to 3 vendor workshop applications. Early application will improve the likelihood of getting the workshops and times desired. We cannot guarantee you will get your first choice. There is a $75 fee for each workshop. Equipment to enhance your vendor workshop is available to rent. If you do not wish to submit any vendor workshop applications, click "none" and proceed to Part 5: Vendor Promotional Extras. Select the number of vendor workshops you wish to present. In 300 characters or less, describe the workshop. Please use paragraph format and complete sentences. Vendor workshop equipment rental is per day. Identify the day(s) you desire to have vendor workshops scheduled. Select the vendor workshop equipment you need for Thursday. Select the vendor workshop equipment you need for Friday. Select the vendor workshop equipment you need for Saturday. Would you like to tell us anything about the times and days of your workshops? NCHE is offering vendors the following additional opportunities to interact with conference attendees. A contact list of attendees who agree to allow their contact information to be given. Vendors must agree to use these contacts only for their own business and not to loan, rent or sell these contacts. In 2018, there were 725 families who gave permission. No, I don't want to order the contact list. NCHE will offer a signature card, one per family, to help to draw attendees to your booth. Prior to the conference, NCHE will promote the vendors that are listed on the card. Adult attendees who complete the card will be entered into a drawing for a $250 cash prize. The signature card will have a minimum of 5 vendor names and a maximum of 30 vendor names, on a first come first served basis. No, I don't want to order the signature card. We are offering the option of ordering a sandwich for lunch that will be delivered to your booth: turkey with American cheese and lettuce and tomato on white bread for Friday lunch and ham with Swiss cheese lettuce and tomato on wheat bread for Saturday lunch. We realize that these are expensive for just a sandwich, but we are making them available for your convenience; there is no profit in it for NCHE. Colleges that have vendor hall booths and order lunch sandwiches, will have their sandwiches delivered to their College Fair tables on Friday. There will also be a concession stand available. Enter the quantity of sandwiches in the payment section below. This is only a sandwich. If you are paying with check and you get an error notice There was a problem with your submission. Errors have been highlighted below, and nothing is highlighted, your entry had been successfully submitted. If you need an invoice, please email spencer.mason@nche.com. Make out the check to NCHE, and write “Vendor Application” in the memo line. Mail your check to NCHE, 8600 Ducksbill Drive, Charlotte, NC 28277-5655.